Blog 5 Lawn Care Myths To Stop Believing Now. #3 Will Shock You! A healthy lawn sets off the design of your home and is a beautiful and comfortable place to relax. Providing the best garden maintenance, but misconceptions abound. To a new or inexperienced homeowner, some common practices sound logical – but they are actually garden maintenance myths! Why not cut the lawn very short to slow the growth or throw away the grass clippings? Here are five garden maintenance myths to stop believing today! Thankfully, no. Each lawn is different, so there is no blanket answer to how much water is needed for every lawn. Different types of seed, shade or sunlight, age of the lawn, soil conditions and grade of the land will be a factor in the amount of water needed. But a general rule of thumb is about 1-1.5 inches a week. That definitely wouldn’t require watering every day. And keep in mind that rain is in included in that total. Watch for run off and soggy surfaces. If water isn’t being absorbed by the surface, it’s coming too fast or too often. Overwatering lawns causes stress on the roots and excessive weed growth. Not true! This is perhaps the most shocking myth of all… To understand why you can stop weeds without herbicides, you must understand how they grow. Weeds thrive only when there are holes in your lawn large enough for them to get the sun they need to grow. No sun – No weeds. If you water, mow and fertilize, your lawn should be thick and healthy enough so that weeds won’t be a problem even without harsh chemicals. 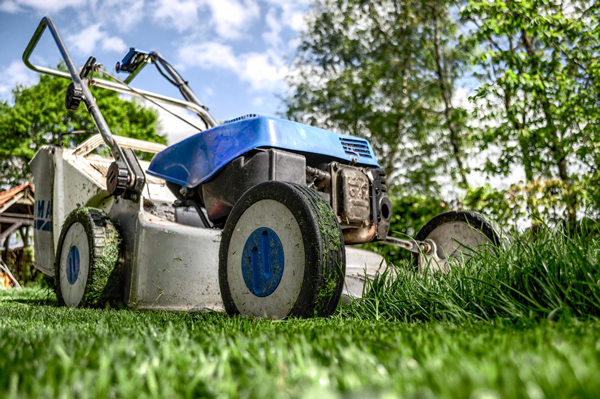 Mowing the lawn too short may seem like a good way to reduce emissions and save time so you don’t have to mow as often, but it actually shocks your lawn and causes it to dry out quickly. Instead, it’s recommended to cut your lawn to a height between 3 and 4 inches. Tall grass is better at handling stress, blocking weeds and retaining moisture. If a lawn is too short, weeds get plenty of sunlight and take over more quickly. 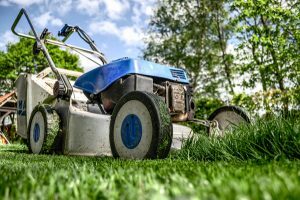 And according to BottomLine Inc., “Scalping” a lawn—mowing off more than one-third of the grass’s height—is the number-one garden-maintenance mistake that home owners make. Doing this sends grass into physiological shock, which leaves the lawn prone to invasion by weeds and less able to cope with drought and other environmental stresses. Nope. Fertilize your lawn in both the spring and fall, just avoid applying lawn fertilizer in the heat of mid-summer. And damaged, newly established or heavily used lawns may need fertilization even more often. The University of Maryland Extension posted a lawn fertilizer schedule for grasses commonly used in home landscaping, such as tall fescue and Kentucky bluegrass. This should be helpful to people who live in our area of the Mid-Atlantic. For more help in keeping your lawn in excellent shape, please contact us. We are experts on garden maintenance and happy to help! We offer not only landscaping services but also construction and snow removal here in the Bethesda, Greater Washington DC and Baltimore areas.